After we published our report Of Durga Mata Theresa May, Demonetization & Brexit many of our readers were stunned with the figures mentioned in it. So here is a follow up with calculations from the official reports explaining how we reached to those figures. 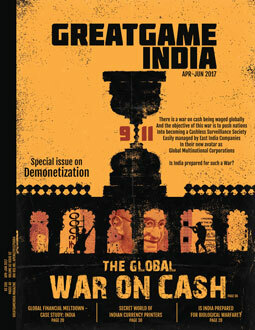 These articles are excerpts from the book India in Cognitive Dissonance published by GreatGameIndia – a quarterly journal on Geopolitics and International relations. For more details on the concepts covered in these articles kindly refer to the book. The annual generation of Black Money in India as a fraction of the GDP estimates vary from 20 to at least 100%; the phrase Black Money and Black Economy perhaps being incorrectly used in each-other’s place (related to each other by a velocity of money whose estimates again vary according to source, or no estimate at all for black-component). Based on this, the amount of Black Money generated since the first demonetization should be at a minimum 30-70 Trillion Dollars, allowing for very heavy variations as claimed in the Finance Ministry Report, and assumptions on the velocity as explained above. The CBI report itself confirms over 500 billion USD is stacked by Indians in Black Money in Banks outside. This may be limited to the amount they have investigated, and is the very lowest of estimates, which will imply 5-Trillion USD black inside India. Just before the 2009 elections, Indian media reported that at least 1.4 Trillion USD is illegally held abroad. This is also the same estimate obtainable from a Global Financial Integrity report. From information on our first demonetization; for every rupee came through banking system, 10 rupees was deposited by the religious institutions. So in current round, if USD 250 billion entered into the banking channel, about 20 * 250 billion went via the Money Lenders – morphed religious institutions. This will give an estimate of USD 5 Trillion as the Black Currency. Next, we take the statement of our Current Prime Minister Honorable Shri Narendra Modi of the promise of bringing 15 Lakh Rs. into every Indian account from the Black Money abroad, this would present a figure of about 5-25 Trillion USD (assuming 1 account per 5- or per 1- person). German, Canadian and French reports say that about 7 Trillion USD belonging to Indians, with probably an equal amount in assets, is in the banking system outside India. So a figure of about 15 Trillion seems to be a reasonable figure for the amount of Black (cash+assets) stacked outside. According to the insider Herve Falciani who says the Government of India has taken only a minuscule amount of the data available with him, “millions of crores” are still flowing out. Even if you assume ‘millions’ means ’5 millions’ and the currency is rupees, this would tell us that about 1- Trillion USD is flowing out. Although, he may not have used the word, if he implied ‘annually’ he most probably did. This figure of 1 Trilllion USD flowing out annually is also the estimate from GFI suggesting that in between 2002-06, the average outflow from all developing countries was 1 Trillion (referred also to Finance Ministry report 2.7.4). India would have the major share. This would again indicate about 25 Trillion USD is some number for the Indian Black Money held outside, allowing for much lower values in the earlier years. 2) Do you have any reasonable studies on the Black-Cash to Black-Asset ratio? This ratio is critical in determining what will happen during demonetization. What explains the suggestion of a “leading” JNU Economics Professor, who is also called an “expert on Black Money”, that this might be 1% , recent tax raids are being used to show this at 6% (with no inputs on sample-size-details!! ), when the figures from the 2012 Finance Ministry report of the Prosecuted Cases (Table 4.3, sec 4.7.12) – all the way from 2006-2012 – show this to be at about 50%, this last being the far more probable value? (Strange that the JNU professor has also been quoted elsewhere in the Finance Ministry Report.) One wonders whether the “leading JNU professor, expert on Black Money” has even bothered reading the finance ministry report. Would this be acceptable in any other Scientific field? Does his figure make sense when compared also against input from the IBGC (NIBM/Fletcher-CoC) report, which places a very high value on the M0 to M2 ratio in India—over 50%? It would appear that the figure 1% is the absolute upper limit for the Ratio BrainUsed : BrainUnused in India’s educated elite. If the Director of ISRO were to sign off a report prepared by ISRO scientists on the dynamics of its spaceflights, using the terms “Mass”, “Momentum” and “Energy” (note our corresponding them with the economic terms above) confusing them interchangeably according to whim and fancy; when the spacecraft is in accelerated curvilinear motion, saying that these quantities “are vague and not definable” – what would you have to say about this report? Is the spacecraft flying according to scary-complicated equations in terms of immeasurable quantities that cannot be defined? Will any science journal worth the name allow confused utilization of the terms Entropy, Temperature and Internal Energy on the grounds that the Entropy is the indicator of disorder and cannot be estimated? Does any single professor of Physics in the country say that Entropy is a vague term and cannot be defined? 4) The ratio of Black (Cash+Assets) in India to the same amount held abroad is another critical number in determining what would happen during demonetization. Not only that this ratio is critical to understand many National-Security issues as well. Do we have any estimate for this ratio? Does the figure in the Finance Ministry’s Report Annexure Table-1 that the Swiss Banks Liabilities towards Indians is Rs 10,000 crores (2010 figure, max 23k crore) make any sense if just one low-level politician in South India spent in the range of Rs 500-1000 crores on his daughter’s wedding post-demonetization? Does this seem to compare with the claim “roughly 72.2 per cent of the illicit assets comprising the [Indian] underground economy is held abroad” as claimed by “The Drivers and Dynamics of Illicit Financial Flows from India” (pub: Global Financial Integrity) quoted by Sec 2.7.4 of Finance Ministry Report? If these figures in the Finance Ministry Report have any credibility (which they don’t as shown), does demonetization inside India make any sense at all, if 72% of the Black economy is outside India? 7) What happened to the Black Money, if it was not somehow re-introduced into the system? 8) Was it the case that the Black Money was transferred outside the country, and is being re-introduced into the system according to the aims and convenience of the foreign geopolitical players, thus preventing the Indian public from realizing the much lower inflation rate that would have been expected? (as we shall see below this may be the only consistent alternative). 9) At what speed was the Black Money re-introduced back into the system? 10) What would have been the impact of the withdrawal restrictions and the supposedly-slow-printing rate on the Velocity of a) the white money and b) the Black component? If as the public saw, the Black Money was given out in thousands of crores without restrictions at all, while white-moneyed people stood in line for 4000 Rs, would this not result in a much-much higher Black-Money-Velocity than the White Money-Velocity? Thus increasing the Black-Economy several fold? 11) Would the Velocity of the Money change after demonetization? Did you make any estimate of the change? “RBI Working Paper Series 06 31 May 2011” has made predictions on the velocity of the M3-money over various time-span of decades with quarterly variations (this value being now very low, near 1.3). So we would have expected to see this for example in the RBI report on demonetization dated 10 March 2017. We do not see any such forecast. Nor did we see a single Indian media-article using this figure. (The RBI report does however indicates that the M3 component was stable except for a 2-month pre-demonetization high. If the M3 component is stable, but the in this context, the value for M0 figure is more critical, but this figure has not been published. Note also from the graphs in “RBI working paper series 06 31 May 2011” that velocities of M1 and M2 components react differently to the M1 and M2 components themselves. Note also the IBGC (NIBM/Fletcher) report on the very high role of the M0 component in India compared to that of other countries. Note also for example and as expected, that the paper “Velocity of Money Function for India” shows clearly that the velocity of the narrow money has stayed consistently high over decades, while the velocity of the M-3 component has fallen significantly). The obvious question that ought to come to the public mind is: If a much higher currency of 2000 rupee note was introduced post-demonetization, and if there was no change in the velocity of money, and with assumptions made on the unavailable M0 value, what would be the impact on the Black Economy, given that the Black Economy is related to the Black Currency via the velocity of money? Wouldn’t it then be set to increase? 12) If the much-smaller white money component itself took several months to print as the government claims, and if this massive Black-Money component was some-how re-introduced into the system before we could even see the common-sense-expected figure for the deflation, how was this miraculous Currency Printing Technology achieved? Was it achieved in India? Or was it outsourced? The answer to this last question is well known. Money printing has been outsourced to companies in the US, UK and Germany; while the issue has been mentioned in the Parliament, no discussion on the implications of this is seen by Indian Security Analysts anywhere. (Refer to our report The Secret World Of Indian Currency Printers). 13) The RBI has refused to answer questions posed under the RTI, clearly stating that there would be a “threat to life” if they answered. Whose responsibility is it to ensure their security? Either the RBI’s economists have completely failed in their duty to the People of India, OR India’s Internal Security Apparatus has failed to provide them the Security and allowed them to speak the truth. Either way a change in the country’s way of functioning is required. In section -11 of the book, we shall discuss this issue of the “threat-to-life” in more detail. That none of these questions were/can be answered and no numbers are given in itself is the proof that the Demonetization is not what it was stated to be, AND it is also proof that the IIMs, the Economic Professors, Financial Experts of the country have badly failed in their duty, relying on big words rather than on solid calculations and theory. If it is a question of lack of knowledge or of ignorance in the Economics and Finance Departments, they better get to some serious studies because they are using Public Money and getting Public Respect. Why have they not done it upto now? But, more seriously, if they have the knowledge and do not want to do this calculation, either out of fear or for selfish cause, then they are certainly complicit with the Fraud and Economic Crimes Perpetuated against the people of India, and are Seditious. We suggest they close shop and go home.